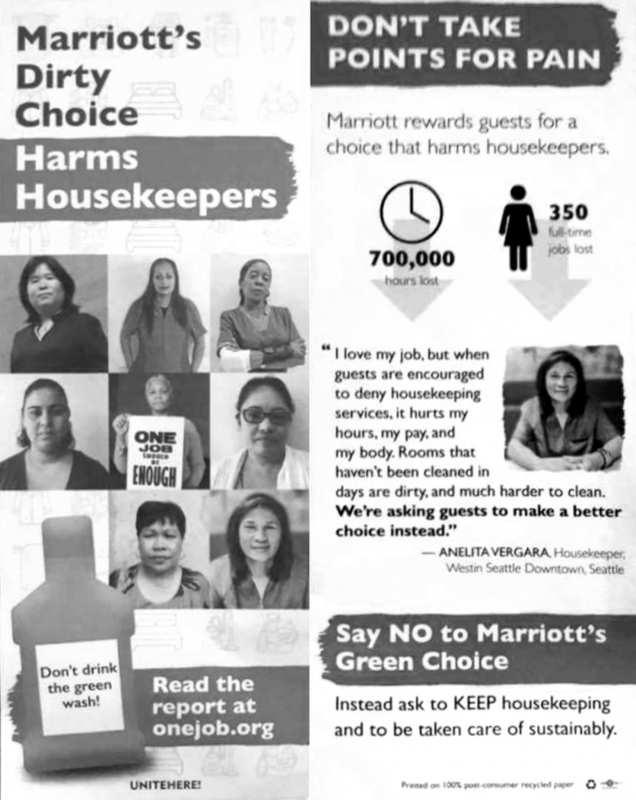 The next time you choose to skip the housekeeping at a Marriott affiliated hotel in the United States and put one of those “Make A Green Choice” tags outside of your room, don’t be surprised if you find one of these leaflets waiting in the evening. Marriott is having a dispute with the union representing housekeeping in many cities and strikes are looming on the horizon. Housekeeping staff members are also complaining that the “Green Choice” initiative is cutting into their hours and are nothing but profit initiative for hotels. You can access Dirty Choice’s website here. Remember that Marriott cut the number of points that members earn for these “Green Choice” nights at Starwood properties by 67% (read more here)? Member now get 500 points at full service properties when choosing Green Choice that cost the hotel $3. Housekeeping staff member perhaps cleans 12 rooms during their shift at full service properties. In San Francisco unionized housekeeping employees earn $22.64 per hour + benefits. This is very easy calculation. The hotel pockets at least six to eight times the cost of points given to the member. How many times do these “Make A Green Choice” points even post without having to chase them after your stay? I did do it few times when I felt that it was worth 500 Starpoints (or sometimes even higher when the hotel was running a promo – didn’t have enough housekeeping staff). But this Green Choice is not about making environmentally sound decisions. It is about fattening the hotels margins and cutting housekeeping employees hours and pay. Perhaps it is time to re-evaluate if it is even worth it?